Twenty years ago today. Any reflections? I wonder what happened to this guy... apparently some government goons hustled him off moments after this picture was taken, and no one knows anything about him. 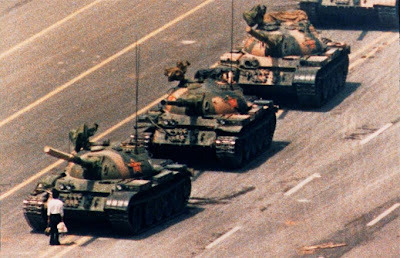 What happened to Tank Man is a mystery. Some say he was executed, some say he is in prison others say he escaped to the West. I think he still is alive in the hearts of all those who want to breath free. There is plenty of video on YouTube showing him getting hustled away. If memory serves, the people who hustled him away were his friends, but I could be wrong. it is one of the most breathtaking acts of courage in the face of oppression we have. I remember it vividly. No what happened to him he will forever be a universal symbol of heroism. Lens is the photojournalism blog — photographs, videos and slide shows. Maybe they will let him out of jail if Obama apologizes for his holding up a nice parade and for American capitalist, imperialist running dog aggression.